It is 26 degrees out today. For my American neighbours to the south, that's about 80 degrees. And considering it's been cold up until 3 days ago, this is such a nice change. Tee's instead of sweaters. Capri's instead of jeans. Yay!!!! 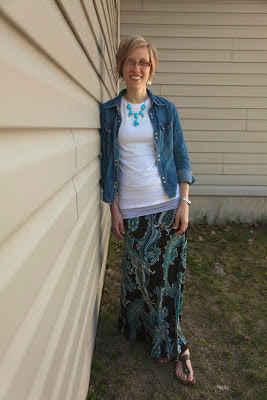 So I'm linking up with WIWS on Messy Wife, Blessed Life today - mostly because I wore one of my FAVE outfits. Alright, I know it looks like I'm closing my eyes, but I'm really not. Jean shirt: Gap - thrifted so many years ago that I almost threw it out last month, but thankfully put it back in my closet and now I wear it all the time. Skirt: No name - thrifted. It's actually a strapless dress, but the fabric is so stretchy it fits me as a maxi skirt and I love it!! Necklace: Le Chateau bought for FULL PRICE...$20. I know, it hurt me too. But I've been wanting this colour and this style necklace and for some odd reason, couldn't find exactly what I wanted (for the right-ish price). Sandals: Soft Moc $40 sale. Loved these so much last summer that I bought another pair in the fall - for this summer. I'm going to wear these until I can't wear 'em no more and then I've got a whole other pair. Yay. **And on a totally unrelated note - we've been trying to get a link-up working for ourselves (we're doing a Book and Tea link up called Leaves) but it doesn't seem to work very well. Can anybody give us suggestions as to why? We signed up with Linky-somthing-or-other and the "linky's" don't work so we gave up on it and just went with regular comments, but we'd like to actually link up. **Also, in case you didn't get a chance to, sign up for our Book Giveaway which happens tomorrow (Monday) morning! 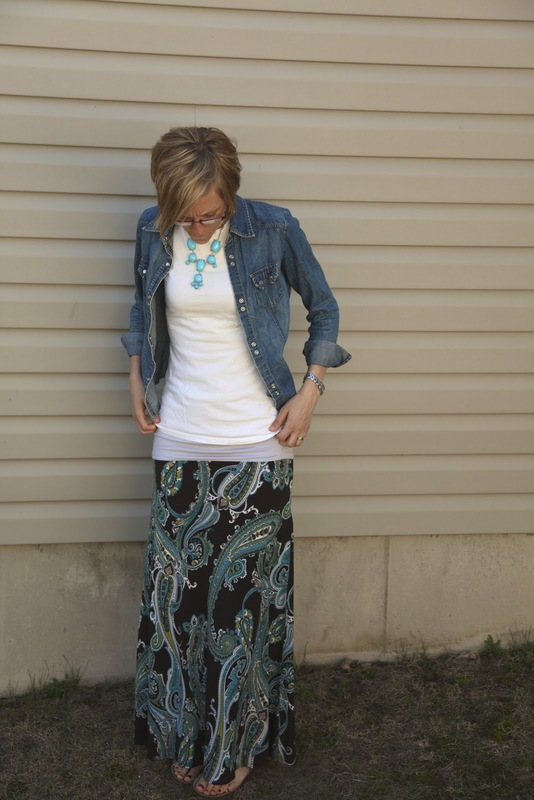 Such a great outfit; feminine, modest, and trendy! Perfection! I just love when I can hack an article of clothing and turn it into something else. I have for sure worn a "dress" as a skirt in the past! That outfit is awesome!! I wish I could just buy it from you (no really). You look gorgeous, my dear! Love those colours (especially teal). I didn't even know Le Chateau was still around. I remember buying stuff there back when babydoll dresses and Doc Martens were the thing. I think I might have even bought a mood ring from them back in the day! Love the bubble necklace. I wonder if I could pull one of those off with a nursing baby? Probably not! totally crushing on that necklace and the shoes and the skirt! love this combo...just fabulous my friend. happy sunday! I really love that necklace. I've been wanting one like that myself, but unless it falls out of the sky for free, that will be on my perpetual wish list! I also love jean jackets/skirts and I think your combo goes so great with your necklace!